Lydia is the favourite child of Marilyn and James Lee. Both of her parent’s want her to fulfil the dreams they never could. Lydia is dead in a nearby lake. Her family doesn’t know that yet. And when they do, it will shatter everything they thought they knew about Lydia, and each other. 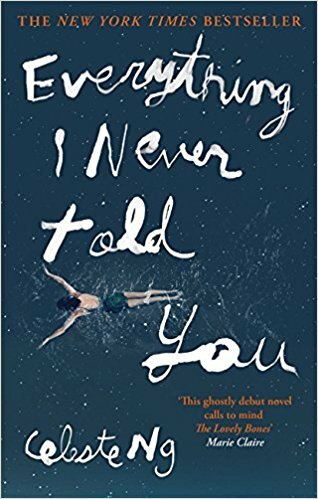 I attempted to read Everything I Never Told You a couple of years ago for the #DiversAThon but only got about 50 or so pages into it as I couldn’t connect to the characters and the story didn’t grab me. This time, I listened to the audiobook narrated by Cassandra Campbell and I found the story easier to consume via audio. I think that’s because while the story is told from multiple points of view there’s also an omniscient feel to the narrative voice. For instance, there’s moments when it comments on the future, or makes an observation that a character couldn’t have known at that moment. There’s a mystery element to Everything I Never Told You as you don’t know how Lydia died, whether it was suicide or if there was someone else with Lydia on the lake. But it’s not as if a character is being an amateur detective trying to solve it, instead it’s more about the repercussions of Lydia’s death on her parents, her older brother Nath and her younger sister Hannah. One thing I did like about this story was that it featured a biracial family. James is Chinese-American, and Marilyn is a blonde white woman so there’s interesting commentary on how their relationship is seen from the outside and also the pressures placed on Lydia and her siblings for looking so different to their peers. Everything I Never Told You is set in the 1970s in a small town in Ohio so there’s no one else but the Lee family that looks “out of place”. It also explores the sexism of the 1960s and 70s as Marilyn dreamed of becoming a doctor and as she tried to pursue that dream, men in her university classes would persistently make comments and her own mother expected her to find a husband and settle down rather than have a career. Everything I Never Told You is frustrating in a way because the whole Lee family is terrible at communicating with one another. No one tells anyone how they really feel about something, what they want to do in their lives, or even honestly share how their day was. They are all putting on a front in different ways, talking to each other in half-truths and bottling up everything they feel they cannot say. Everything I Never Told You is mostly a study of a family. A family who has suddenly experienced something tragic and are all grieving differently. There’s a distance between the reader and the characters due to the narrative voice, however that does fit in well with this book as the characters are distant from one another too. 3/5.